(Bloomberg Opinion) -- The digital-music company Spotify and Apple Inc. are pretending a business dispute is a moral war. Last week, in a fight over Apple’s mobile app storefront, Spotify Technology SA painted Apple as a bully that keeps people from enjoying music they love. Apple portrayed itself as a job-creating protector of the Everyman and Spotify as a scourge. Each company is grandstanding. Each is pursuing self-interest disguised as high-minded values. Each company is wrong on some facts and generally being tacky. There are no heroes here. For years, Spotify and some other companies have said it's not fair that when they sell digital items for use in their iPhone and iPad apps – such as a digital-music subscription, electronic book or virtual weapon in a video game – they need to go by Apple's sometimes silly rules, use Apple’s payment system and hand over up to 30 percent of each purchase. Spotify has never liked this, and relations got worse after Apple in 2015 started a competing music service. Spotify has opted, as did Netflix recently, not to sell paid subscriptions in its Apple mobile apps. Instead, it sells subscriptions on its website, where it doesn’t need to split revenue with Apple. Surely Spotify misses out on some potential subscribers who are confused why they can’t buy a subscription in the app. Spotify has occasionally gotten into public spats over the App Store, but last week Spotify went nuclear. It said it had filed a formal complaint with European regulators about Apple's app rules. Spotify sent its chief executive and top lawyer on a press tour, and also created an (adorable) YouTube video and online materials to win consumers over to its side. I will spare you the details, except to say that some of Spotify’s points are fair; the company also made claims that are untrue or irrelevant. What Spotify didn’t say is why it is pressing this longstanding gripe at this moment. It must be that the company sees some opening to win concessions from Apple. European regulators and some U.S. politicians such as Elizabeth Warren have criticized the power of big tech companies to tilt rules in their favor. Other powerful app makers also have more recently complained about the terms of mobile app stores. Given all this, Spotify may believe it has leverage to press its objections now because opinion and the political winds are blowing in its favor. Or maybe Spotify plans to raise its prices and wants to blame Apple. 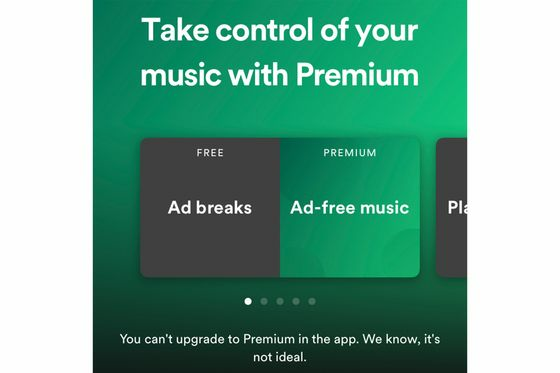 Instead of a response to the obvious question – why now, Spotify? – we have only table-pounding by CEO Daniel Ek, who made a tortured metaphor about Apple as a cheater at ping pong. I'm sympathetic to some of Spotify’s gripes. I find it particularly hostile that Apple doesn't let app makers tell people how to buy subscriptions if – like Spotify, Amazon and Netflix – they don't sell digital goods inside their iPhone and iPad apps to avoid sharing revenue with Apple. Reasonable people can disagree about whether Apple is getting too much for what it does in its app storefront. It did cut in half its app commissions on longer-term subscriptions several years ago in response to developers’ gripes. But Spotify drained any goodwill I had by disguising its motives. Apple being Apple, its counterpoints were sometimes disingenuous, too. 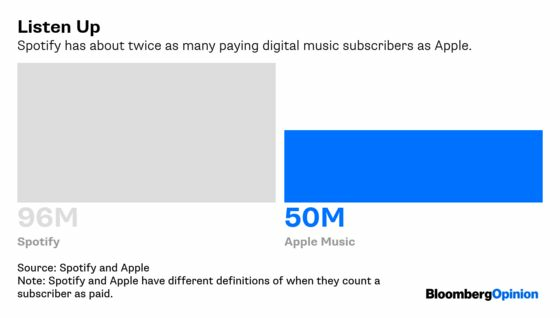 Apple started its Spotify response by talking about “human ingenuity and creativity,” and said Spotify – whose annual revenue is one-fortieth the size of Apple’s – is the big, bad bully. Apple has a history of portraying business disagreements as moral crusades. It did it with Samsung Electronics Co., which Apple accused of ripping off the iPhone, and with chip maker Qualcomm Inc., which – in an echo of Spotify's complaint against Apple – it accuses of setting unfair rules for its products. Apple had valid disagreements with Samsung and Qualcomm; its issues with Spotify are valid, too. But Apple ignores its own interests here. It doesn’t want to give an inch more and risk dinging a highly lucrative business. 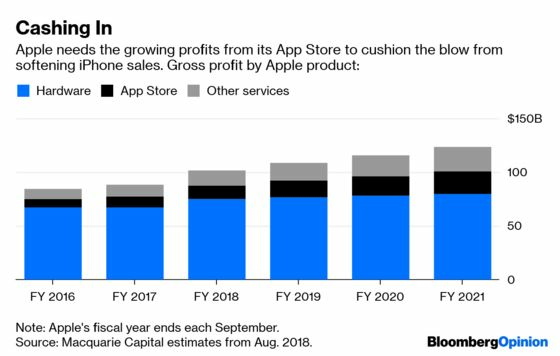 Apple is likely selling fewer iPhones and it needs revenue from apps and other internet-related services to fill the gap. There also is a potential conflict in Apple’s role as both an important distributor of other companies’ digital music and video services, and increasingly an operator of Apple’s own versions. Mostly, it would be good if Apple and especially Spotify were honest rather than claiming a moral high ground built on half-truths. What if Spotify said, we have always believed Apple app commissions are too high, and now think we can force Apple to bend because of the regulatory spotlight? What if Apple said: We assembled hundreds of millions of loyal iPhone owners and built a digital-payment system to support them, and we need to get paid for that valuable commodity? Like squabbling children, we should ignore Apple and Spotify until they resolve this dispute on their own. And like the parent of squabbling children, I don't want to hear any more until Spotify and Apple can talk about this rationally and honestly. Apple also doesn't allow apps to direct people to a company's website, which means it isn't obvious how to buy a subscription if people look only at Spotify's iPhone or iPad app. Margrethe Vestager, the EU antitrust chief, seemed neutral to the idea that Apple's app storefront was a monopoly. Google is in a similar position with its Play store for apps and Google-owned digital services such as YouTubeand various other music and video offerings. However, Google's app storefront has looser rules than Apple's. Apple came pretty close. "We provide the platform by which users download and update their app," Apple's statement said. "And we built a secure payment system — no small undertaking — which allows users to have faith in in-app transactions."